Lucy, Wyatt, and Rufus chase Flynn to Nazi Germany, where they suspect he is planning to give an atomic weapon to the enemy. While they team up with a British spy, Lucy suffers from self-doubt. 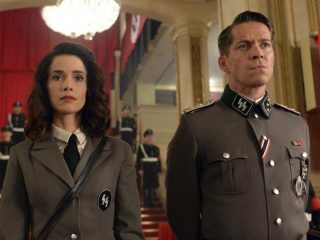 Lucy (Abigail Spencer), Wyatt (Matt Lanter), and Rufus (Malcolm Barrett) are shocked when they're told the mothership has landed in Nazi Germany, but time is short, and they're the only ones equipped to kill Flynn (Goran Vi�njic) and end his psychotic crusade. Now, in hot pursuit of a genius with sinister associations, the team weighs the consequences of Flynn's destruction, meets the man behind one of literature's most popular figures, and endures a very uncomfortable ... party. Also starring Paterson Joseph, Sakina Jaffrey and Claudia Doumit. Guest starring Sean Maguire, Matt Frewer and Chad Rook.